Wedding colors for an outdoor spring wedding. Spring time brings with it a color palette of bright vibrant hues, great for wedding colors. Spring makes one think of daffodils and crocuses. 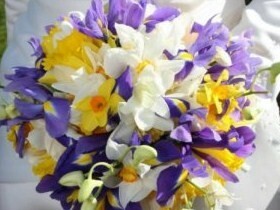 I also think of Easter and with that in mind lets look at shades of violet and sunshine yellow bouquets. Then there is also Valentines day, what a wonderful time of the year to get married.